This is one page that gives me great solace when I'm away from the beach. I can simply click onto the Rasananda website and then go to the live webcam and spend a good five minutes just watching the red flags of the resort fluttering in the breeze and the bored staff wondering around the empty pool looking like they are busy. It is addictive viewing. I believe it is the first live webcam from Thong Nai Pan Noi. I'm not sure there sure that there should be more. After all, what happens on the beach should stay on the beach. Perhaps someone will spot Ryan Giggs on the webcam this summer regaling some C list celebrity with tales of his Welsh wizardry on the ball. If you want to read more about Rasananda Resort click the link. Changes are a foot again on Thong Nai Pan Noi. Restaurants and accommodation changes on the beach. Firstly, Pong's new restaurant has finally opened in the place that used to be Pong's Republic near the bridge. The failed night club looks set to succeed as a restaurant. It is an imposing glass and steel construction. with decking and water feature. Pong is a great cook. His Burmese dishes are particularly good. Being positioned at the higher end of the market and considering the position of the restaurant just opposite Luna Lounge, it is a big challenge to the popularity of the Luna Lounge. The battle of the posh restaurants is on. 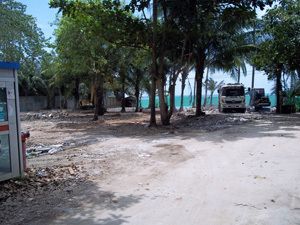 Big changes are in progress on Thong Nai Pan Noi beach. As you can see from the photograph above the Baan Panburi has been pulled down. It seems that Rasananda has got the land and plans to expand their row of luxury beach villas with small plunge pools. For the time being the Star Huts is still standing, but these bungalows are also destined to vanish. The owners of Rasananda have bought this land too and plan to build mid range accommodation under the moniker of Buri Rasa. Star Huts, a long time favourite with backpackers, will be sorely missed. Some of the people from Star Huts have been given the land next to Tanaporn Massage House. They will build a restaurant. Much of the road from Ban Tai to Thong Nai Pan has now been completed. It is a high quality road that will last longer than previous parts of the road. The Thong Nai Pan area is destined for preeminence on the island. There are only 3 outfits that are now beachfront on Thong Nai Pan Noi: Thong Tapan (and Tapan Noi which is owned by the same family), Phuwadee and Rasananda. Since Phuwadee is only leased land this is destined to get swallowed up by Rasananda too. 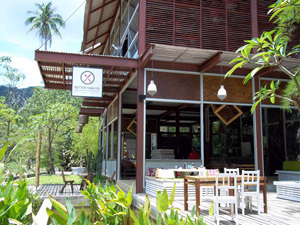 They are the newest business on the beach and yet they are destined to dominate the accommodation on Thong Nai Pan Noi. It is only the locally owned Thong Tapan that is between them and owning it all.